It’s true: personalization is popular. It can be tricky. And, a lot of times, not all it’s cracked up to be. What makes us get into trouble with personalization? 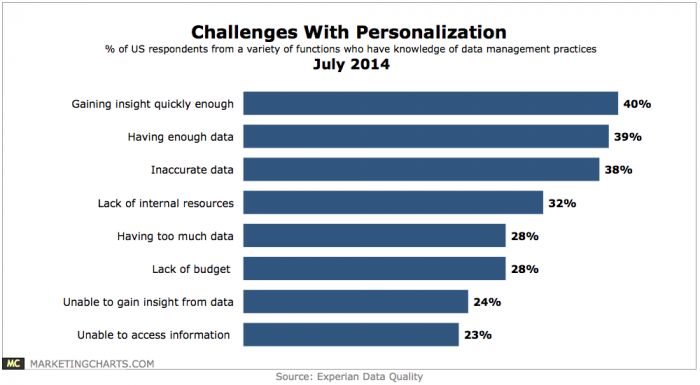 According to results from an Experian survey, data is often the main culprit for ruining personalized outreach tactics. Why? Because it can take time to collect enough useful data, sometimes there isn’t enough data for solid findings, and, the most nerve-wracking reason of all, sometimes data can’t be trusted. Other issues with personalization included having a lack of internal resources, too much data, a lack of budget, no insight gained from data, or an inability to access information. Basically, personalization is hit or miss. And it’s more likely to be a miss than a hit these days. Plus, if you’re working with a list of cold emails or prospects you don’t really know, it’s really difficult to be personal with your prospects. So if personalization is out, what’s in? Luckily, there are a lot of ways to still send valuable, customer-driven content. Let’s start with individualizing your efforts. Personalization in marketing and outreach has blown up over the years. I’m sure you’ve received tons of mailings with your name in them, or emails with your name in the subject line of the body. But the jig is up. Everyone is doing it, and we aren’t opening emails thinking it was sent just to us (and not a mail merge of 500,000 addresses). It can also be a bit cheesy, and tons of companies don’t know what the difference is between individualization and personalization. You have to really get to know people as people, not just their name. 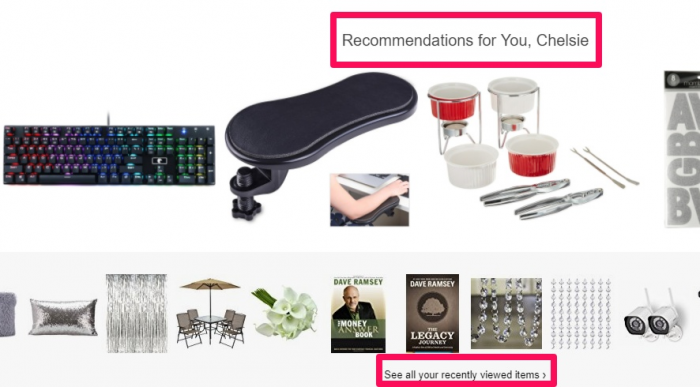 For example, what do you notice most when you log in to your Amazon account? Are you more blown away by your name in the corner, or that they have a catalog of your recent purchases and even recommendations for what you might want to buy next? I’m guessing you said the latter. So you have to apply the same mindset to cold emails. It’s not about putting their name on the email, because they’ll see right through that tactic. It’s about building a relationship. If it’s an influencer, start by doing some research on who you’re talking to. LinkedIn is the perfect place. Now, you’ve got a starting point and a basis of communication. You know exactly where this person lives, has lived, works, has worked in the past, etc. The next step is putting the right formulas to work. Every single line of your cold email is important. And it’s equal parts art and science. Every line should compel the reader to keep going, so there’s no room to scrimp or add unnecessary fluff. It all has to hook them in. Luckily, you don’t have to be the next Poet Laureate to get this done. There are tons of formulas that have been proven to help you meet this goal. Copywriters have used these persuasive methods for decades to influence people to read their content and take the desired action. They work, and they can work for you. Here are three quick formulas to try out to boost your reply rates. Before: Open with their current situation. After: Describe their life and situation after you solve this problem. Bridge: Give them the way they can get to that solution (hint: it’s with your product/service). Start out by presenting your prospect with a problem that is unique and relevant to them. Then, reel them in by explaining how different (AKA better) their life would be if that problem was non-existent. Close your outreach by telling them how your idea, service, or product can make that dream a reality for them. 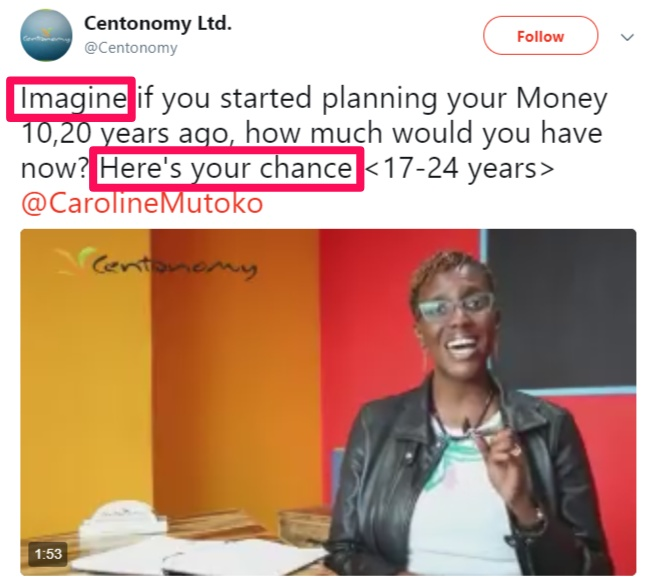 They show you how your life is now, explain how they can make it better, and then give you the solution to making it a reality in their explainer video. It’s brilliant and effective. Problem: Hit on a pain point. Agitate: Hit on that pain point, again. Solve: Give them a solution to alleviate the pain. Instead of giving people a vision of how great their life will be after finding a solution, it focuses on pointing out exactly how big their problem really is. This method presents your product or service as exactly what they need to come out on top and crush the problem. This one works because pain is even more motivating than pleasure. People will go out of their way to avoid problems if there’s a solution out there. Praise: Open up your outreach with a compliment. 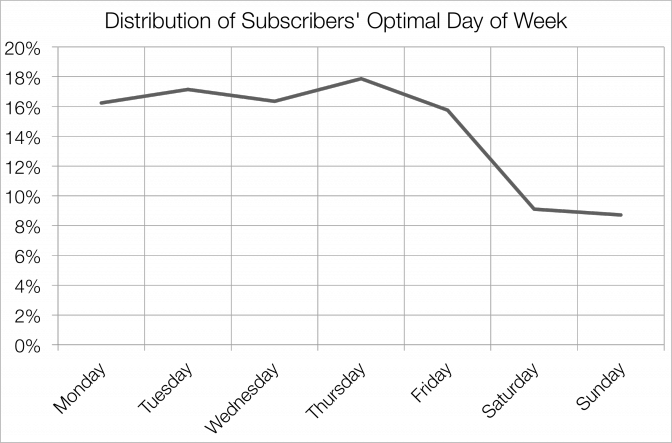 Picture: Explain how your product or service can help them (cause-and-effect). Push: Ask them to give it a try or commit to your idea. This method is proven to work because it’s based directly on psychology. Praise is as much of a reward to our pleasure centers in the brain as receiving cash. And when you break down cause-and-effect, you’ll build trust. Then, by explaining some of the benefits if they respond to you or engage with your CTA, they’ll want to know more. Here’s how it looks in action. Make every line count, but don’t make the reader sit through tons of copy. Be sure to keep the message succinct and to the point. Keeping your pitch short, especially if you’re contacting someone for the first time, is essential to succeeding with your outreach. 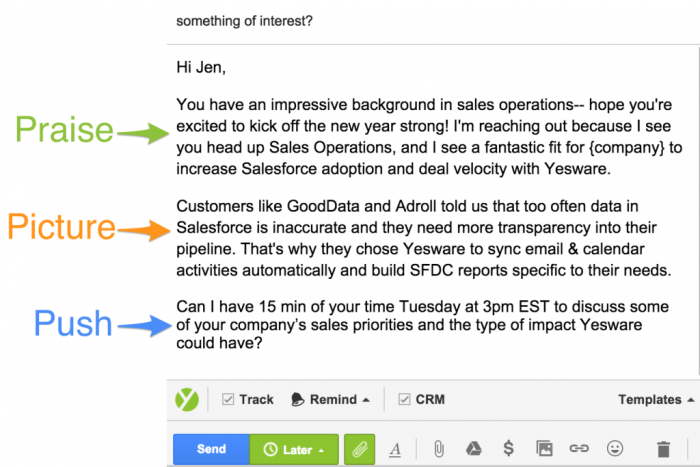 You’ve got to gauge a prospect’s interest before you hit them with every single detail. Otherwise, you’re wasting your own time. It can be tempting to want to include everything about your product or service right away. But information overload will make people put off getting back to you, or can even stop them from looking at what you have to say in the first place. Notice how he made a pitch, but also asked the recipient if he’s even interested in what he’s got to offer before laying it all out on the table? There’s no need to add in anything else. Delete anything that may not relate to the main idea of why you’re reaching out, and save the other juicy details for later. You don’t want to give too much away too soon. If someone doesn’t respond to you the first time, you need to have more information to entice them with later. Another great way to pull in readers is with an exclusive offer. 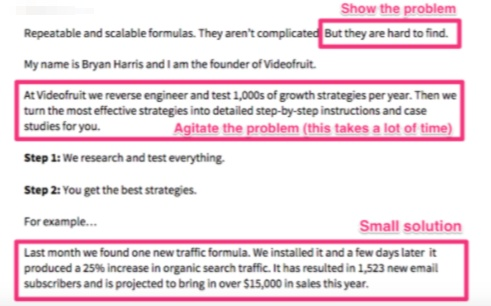 If your cold emails don’t propose something of value, the reader isn’t going to care. Offer them something they can’t refuse, and make it really simple to understand. Use subheadings, bullet points, and white space so that they won’t get lost in a sea of chunky text. Your CTA has to back up this offer, too. If you want to offer a free trial, say so! Then add in a CTA button linking to a landing page that says “Sign up for your free trial today” so that there’s no question about what your offer is or where to find it. 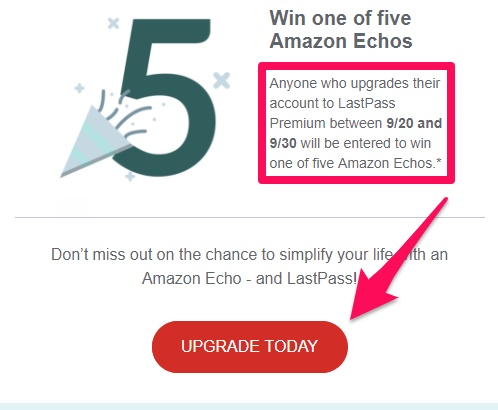 Here’s how LastPass does this with an offer to win an Amazon Echo for upgrading. Pretty hard to resist, right? It’s a sweet deal. Don’t bury your offer in random links. 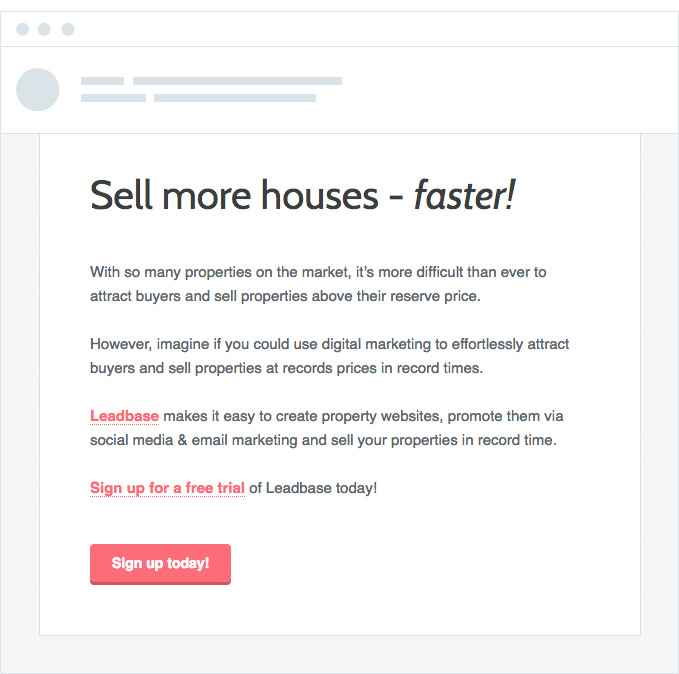 You want to drive the reader to your landing page quickly. If you’re reaching out to people, especially influencers, you need to tell them why they should care about you. You can do this (and make them feel special) right in your offer. You’ll also be proving your credibility through the offer, since they’ll get the chance to see for themselves what you’re worth by trying out your product or service for free with a trial. They may have never even heard of your company or what you do, but they’ll be more likely to take notice if they know they have nothing to lose with your offer. But if you don’t have a product or service that translates to you “free trial,” you can still offer them something. For example, if you’re just reaching out to see about doing a guest post with them, offer the first pitch for free. And you can even offer them something right in the subject line. Your subject line is where you can really make a lasting impression on someone, especially when sending cold emails. And 33 percent of recipients make choices about which emails to open or ignore solely based on the subject line. This Grammarly subject line even adds in a bit of need-to-do-this-right-now. No one wants to have FOMO. Share an offer, relieve a pain point, or provide value right in the subject line of your email. That will make them click and open it to read the rest. Email subject lines with 21 characters or less get exceptionally high open rates, and subject lines that show urgency or an exclusive offer can increase open rates by 22 percent. 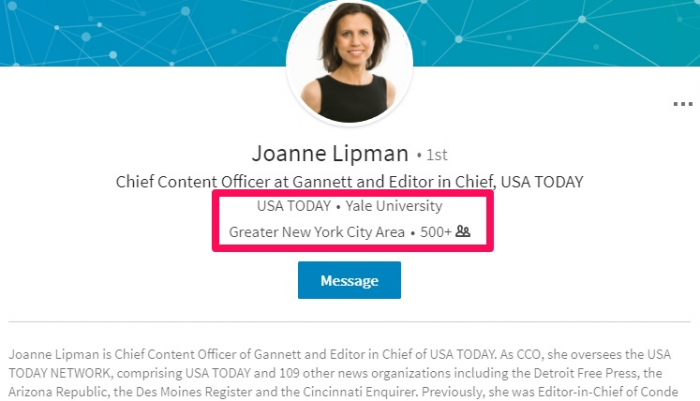 Just using words like “urgent” or “breaking” can have a huge impact on your open rate. For example, using a subject line like “Business deal from ________” will make it sound like you think that the prospect is already going to strike a deal with you. This is the equivalent of asking someone to come home for Christmas with you and meet your parents after just one date. Get to know them first and see if they’re interested. It also helps to schedule your emails and follow-ups on the right days and times. If you aren’t sending emails out at the right time or day of the week, then you’re basically doing a lot of work for nothing. They aren’t going to perform as well. You need a plan, and you’ll have to do some A/B testing to find out which days and times work best for your company and audience. You can also look to some tested research on the best days and times. 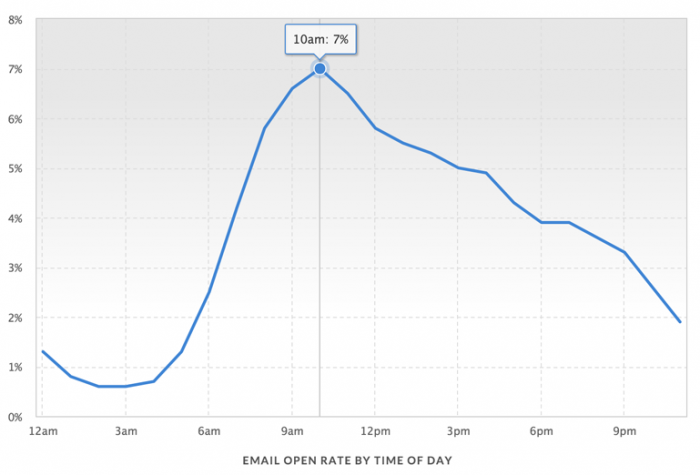 Emails perform best on Tuesday, Thursday, and Wednesday. Tuesday is by far the number one day to send out emails, but if you want to send more than one in a week, take a look at Thursday or Wednesday. HubSpot research found similar results, showing that Tuesday is the best day to send out emails, with Monday and Wednesday following close behind in their study. 10 am. 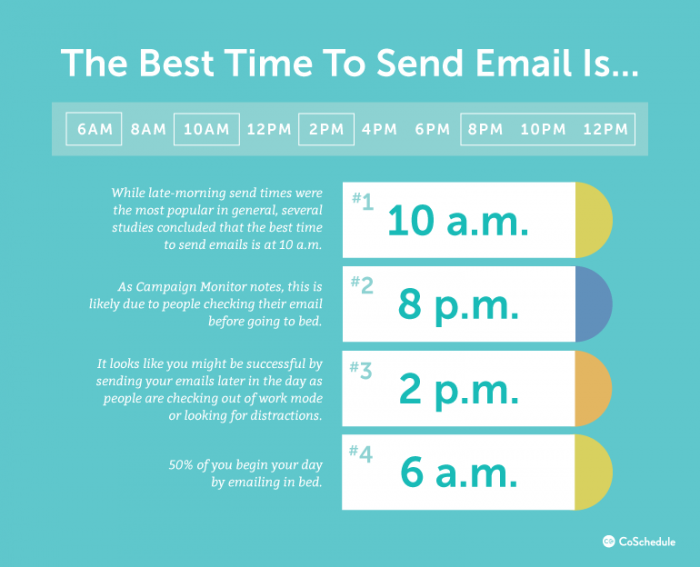 : Makes sense, as late morning is the time of day when most people probably get around to checking emails. 8 pm: People like to check their inboxes before winding down for the evening. 2 pm: I don’t know about you, but I tend to check my inbox for the second time after lunch, so this seems like a reasonable time of day to send an email. 6 am: Some people check their emails before even rolling out of bed. Take advantage of it. Send a thank you within 24 hours. Wait 48 hours after submitting an application or inquiry about working together. Check back in one to two weeks to follow-up on a request to meet with them or after getting no response about an offer to work together. Circle back on a connection every three months. Personalization is popular, but it isn’t always profitable or effective. You can thank unreliable data for its demise. And when it comes to cold outreach, it just isn’t effective. The first interaction with someone can’t always be personalized. You want to make a great first impression, so you’ve got to talk to each prospect or customer differently and use other tactics to win them over. Individualize your efforts and use formulas that are proven to work. Try out the BAB, PAS, and 3P’s formulas to amp up your copy. Keep things short and concise so that you aren’t wasting time with long emails that people won’t even read through. Make an offer your readers can’t pass up. Optimize your subject lines and time your initial emails and follow-ups at the best days and times so that they aren’t ignored or deleted. 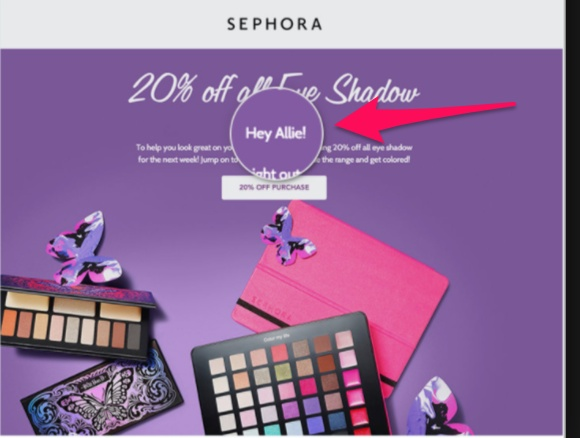 It might seem odd but running outreach campaigns that actually get you results means turning away from personalization and going against the grain with these tactics instead.